Posted on April 10, 2017 at 3:35 pm. This last week was exciting as we had some important hearings and the budget debate on the House Floor. Trayce Bradford watched about 14 hours of the 15 hour debate and it was full of drama, strategy, frustration (sometimes maddening) a few laughs, boos and even prayer. The process is something we encourage everyone to watch and learn more about. In the midst of that debate, the US sent tomahawk missiles into Syria and Rep. Matt Schaefer asked for the members in the House to stop and pray for those involved – which they did. Please keep all of our leaders in Austin in your prayers and also please pray that we have wisdom on the issues we need to strategy on. #1 – Potentially Dangerous Legislation – Read this insightful article from Texas Right to Life. House Bill 3958 is currently sitting in the Public Health Committee. If this bill moves, we will ask for your help reaching out to legislators, but for now, we wanted to be sure and draw this to your attention. #2 – Budget Bill – Here is a good summary of the budget battle. We will add that Rep. Matt Krause amended an amendment (yes, that does happen!) by Rep. Schofield and added $20 million dollars toward funding alternatives to abortions and Rep. Jeff Leach added an amendment to Rep. Shaheen’s amendment to wipe out funding to Texas Film Commission and monies (around $10 million) which would now go to core government services like the Healthy Texas Women’s program that provides women’s healthcare along with focusing on abortion alternatives. Rep. Jonathan Stickland gave a strongly worded speech using a personal privilege as a Member of the House. He said he had never done that in his three terms but felt that he needed to speak out against maneuvers being used on the floor to obstruct the process. The 15 hour debate came to an abrupt end (of course, as Trayce had stepped away for that particular 20 seconds) when all the remaining amendments (over 150) were added by a vote to Article 11, which we learned is the wish list/graveyard for those amendments, and it will be decided upon in the conference committee. The budget process is an experience and the battle is not over yet. #3 – Protection for Faith Based Adoption/Foster Care Providers – Please call Senate State Affairs Chair Joan Huffman (512-463-0117), and Lt. Governor Dan Patrick (512-463-5342) and tell them we want a hearing on Senator Charles Perry’s Senate Bill 892 relating to protection of the rights of conscience for child welfare services providers. This bill would ensure that the government cannot discriminate against faith-based adoption and foster care providers in licensing, contracting, or funding for 1) facilitating child welfare services in accord with sincere religious beliefs, 2) providing children with a religious education, or 3) declining to facilitate abortions or provide abortifacient drugs or devices. The House had a hearing last session and this session regarding these protections, and it is inexcusable for the Senate to not have had a hearing on this bill. 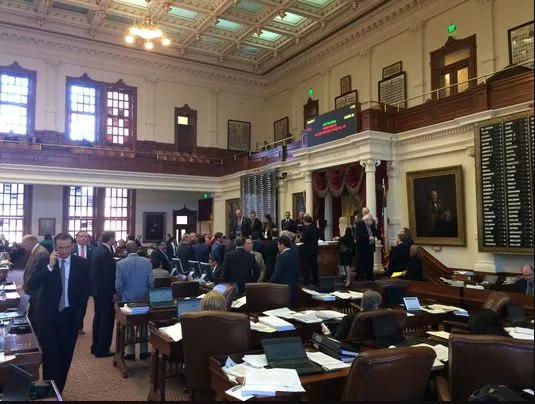 #4 – Protecting our Electric Grid – Senator Bob Hall’s Protecting the Texas Electric Grid legislation SB83 will have a hearing Tuesday morning in the Business and Commerce Committee. We are very thankful to get this hearing and there will be a number of subject matter experts that will be testifying. We encourage you to pray for this hearing. If you are in the area, please sign in to support the bill. We are not asking people to testify as they have a hefty team ready to do that, however signing in support of the bill is helpful. Finally, call your Senator and let them know you support this piece of legislation – that it is an investment in our states’ future. When Texas is the only state to have its own grid takes steps to protect that grid from cyber, natural or other threats, Texas will be even more appealing to business, that is good news for Texas and good news for Texas business. 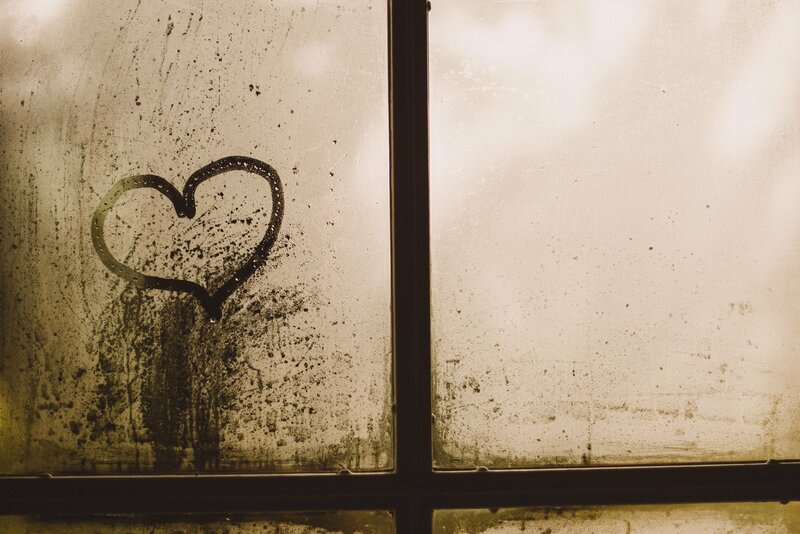 #5 – PLEASE PRAY! There have been a number of situations that have been impacting legislators and their families, the most recent was Chairman Phil King being hospitalized not long after speaking on the House Floor. Please pray for their staff, family members and the activists who are working hard on the issues that we care about. Please ask others to join you in praying. 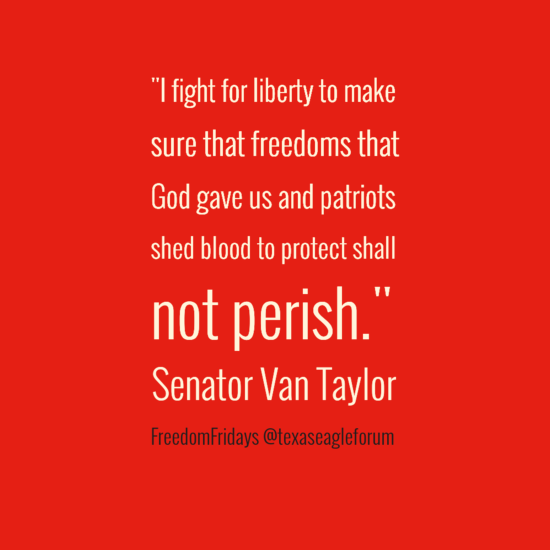 Please pass our Freedom Friday quotes along like the latest from Senator Van Taylor. We still want to hear from you and why you fight for liberty. Hit reply to this email and let us know. Please share our Women Wednesday blogs like this week’s by Bunni Pounds and be on the lookout for some video updates in the near future on social media. Please consider a contribution to Texas Eagle Forum. Your support is so important to us. You can share this top 5 straight from our website here. Thank you so much for everything you do and keeping informed through Texas Eagle Forum. We are fighting for you.